USA: Simon & Schuster. Hardcover. 0671691740 734 pages. Index. Upon front free endpaper is handwritten in ink "for Bonnie Anderson with a blessing for courage, Malachi 05/28/94. "Reveals the untold story behind the Vatican's role in the collapse of the Iron Curtain, as well as Pope John Paul's far-reaching assessment of the three-way contest now unfolding among the global powers - the Soviet Union under Mikhail Gorbachev, the capitalist nations of the West, and the Pope's own universal Roman Church. - a winner-take-all race against time and each other to establish, maintain, and control the first one-world government that has ever existed on the face of the earth." - from dust jacket. Tight and square. Clean and unmarked with light wear. Nice copy. . Very Good. 1990. First Printing. 1990-09-08. New. Ships with Tracking Number! INTERNATIONAL WORLDWIDE Shipping available. Buy with confidence, excellent customer service! 1991-05-06. New. Ships with Tracking Number! INTERNATIONAL WORLDWIDE Shipping available. Buy with confidence, excellent customer service! New York: Simon and Schuster, 1990. Second Printing. very good, very good. 734, index. The Vatican's role in the collapse of the Iron Curtain, as well as Pope John Paul II's far-reaching assessment of the three-way contest now unfolding among the global powers. New York: Simon and Schuster, 1990. Fifth Printing. fair to good, good. 734, index, pencil underlining and yellow highlighting to text, top & bottom DJ edges somewhat creasedThe Vatican's role in the collapse of the Iron Curtain, as well as Pope John Paul II's far-reaching assessment of the three-way contest now unfolding among the global powers. KEYS OF THIS BLOOD: STRUGGLE FOR WORLD DOMINION BETWEEN POPE JOHN PAUL II, MIKHAIL GORBACHEV & THE CAPITALIST WEST, The. New York: Simon & Schuster, (1990). Stated first edition. Cloth backed paper covered boards. Thick 8vo. pp. 733. Index. Fine/Near Fine/Unclipped price in mylar. Trace edge of dye transfer on jacket rear. ISBN: 0671691740..
Simon & Schuster. Hardcover. 0671691740 New Condition. . New. Simon & Schuster, 1990-09-01. Hardcover. New. Brand new hardcover with dust jacket. Daily shipping. Riverside, New Jersey, U.S.A.: Simon & Schuster, 1990. (1st) Large, thicker, heavy book, dark blue cloth spine, maroon boards, bright gilt lettering on spine, 734 lightly browned pages. DJ glossy light green, color-illustration of papal insignia on front, purple lettering, praise on back from Martin's books. DJ and book, both As New.. First Edition. Hard Cover. As New/As New. Simon & Schuster. PAPERBACK. 0671747231 Special order direct from the distributor . New. 1990-09-08. Good. Ships with Tracking Number! INTERNATIONAL WORLDWIDE Shipping available. May not contain Access Codes or Supplements. May be ex-library. Shipping & Handling by region. Buy with confidence, excellent customer service! The Keys of This Blood: The Struggle fopr World Dominion Between Pope John Paul II, Mikhail Gorbachev & the Capitalist West by Malachi Martin Only Malachi Martin, consummate Vatican insider and intelligence expert, could reveal the untold story behind the Vatican's role in today's winner-take-all race against time to establish, maintain, and control the first one-world government. * Will America lead the way to the new world order? * Is Pope John Paul II winning the battle for faith? * Is the breakup of the Soviet empire masking Gorbachev's worldwide agenda? The Keys of This Blood is a book of stunning geopolitical revelations. It presents a compelling array of daring blueprints for global power, and one of them is the portrait of the future. Simon & Schuster, 1991-09-15. Paperback. Used:Good. 1991-05-06. Good. Ships with Tracking Number! INTERNATIONAL WORLDWIDE Shipping available. May not contain Access Codes or Supplements. May be ex-library. Shipping & Handling by region. Buy with confidence, excellent customer service! 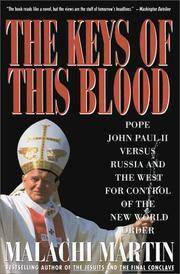 "Keys of This Blood: Pope John II, Gorbachev, and Struggle for New World Order"
Simon & Schuster. Hardcover. 0671691740 Like New Condition. . Fine. Simon & Schuster, 1991-09-15. Paperback. Used:Good. In Stock. Always but with confidence. U S. A.: Simon & Schuster (Juv). Fine. 1990. Glossy Soft Cover. 0671747231 734pp including index The struggle for world dominion between Pope John Paul II, Mikhail Gorbachev, and the capitalist West . New York: Simon & Schuster, 1990. Hardcover. pp. 734. 8vo. Gray cloth over maroo paper boards with gilt lettering to spine. Light general shelfwear, contents clean and unmarked with tight, sound binding; very good+ and housed in very good lightly rubbed and price-clipped dustjacket. Simon & Schuster, 1991-09-15. Paperback. Good. New York: Simon &amp; Schuster, 1990. Second. Hardcover. Very good/Very good. 8vo. pp.734.heavy book additional postage will apply,""Examines the role played by Pope John Paul II and Mikhail Gorbachev during the recent collapse of communism in Eastern Europe""
Simon & Schuster, 1990-09-01. First Edition. Hardcover. Very Good/Very Good Minus. Very good first edition in very good MINUS price unclipped dust jacket ($24.95). Binding is tight. Jacket is tanned with some shelfwear. Will ship (and look nice) in a quality clear Brodart cover. Simon & Schuster, 1990-09-01. Hardcover. Good. 1990 used hardcover copy,full number line, no dust jacket general use wear but no pen markings on the pages. Simon & Schuster, 1990-09-01. Hardcover. Very Good. Hardcover and dust jacket. Good binding and cover. Clean, unmarked pages. Soiling to bottom page ends. Ships daily. Simon & Schuster. PAPERBACK. 0671747231 Nice used book. Previous owner's name stamped on back of front cover. Black mark across bottom outer page edges. Crease on back cover. Pages are yellowish on edges. . Fine. Simon & Schuster, 1990-09-01. Hardcover. Good. U S. A.: Simon & Schuster. Near Fine. 1990. Softcover. 0671747231 734pp including index A book of stunning geopolitical revelations. It presents a compelling array of daring blueprints for global power, and one of them is the portait of the future Pages are age-toned with crease and darker tone on rear facing page . Touchstone Book, 1990. 733 pages, black pictorial with red & white ltrs, corners and edges are nicked. Pope John Paul II versus Russia and the West for control of the New World Order. Religous and current affairs.. 2nd Printing. Trade Paperback. Very Good. 8vo - over 7¾" - 9¾" tall. Simon & Schuster, September 1991. Trade Paperback. Good - Cash. General use wear, surface and edges rubbed with some creasing. Corners bumped and show wear. Pages show reader wear. Text has underlining and/or notations. Previous owner's name inside. Book club. Stock photos may not look exactly like the book. New York: Touchstone - Simon & Schuster, 1990. Trade paperback; index; 734 pages. Book is good: light wear to extremities with creasing to covers; endpapers slightly darkened; text is clean and tight, no marks..
Simon & Schuster, 1990. Hardcover. Acceptable. Disclaimer:A readable copy. All pages are intact, and the cover is intact. Pages can include considerable notes-in pen or highlighter-but the notes cannot obscure the text. The dust jacket is missing. At ThriftBooks, our motto is: Read More, Spend Less. Simon & Schuster. PAPERBACK. 0671747231 Item in acceptable condition including possible liquid damage. As well, answers may be filled in. Lastly, may be missing components, e.g. missing DVDs, CDs, Access Code, etc. . Fair. Simon & Schuster, 1991-09-15. Paperback. Very Good. Softcover showing minor scuffing. Spine is mostly uncreased. Edges and corners showing minor wear. Pages are unmarked or folded. Westminister, Maryland, U.S.A.: Alfred a Knopf Inc. 4/2. 1984. First Edition. Hard Cover. 9780394530154 4/2 null 0394530152 Very Good/Fair null 0394530152 Library of Congress: 82-48733 This hardcover is a nice tight first edition printing. Dustjacket is in sad shape, but boards are nice. 430 pages. No alien writing inside. .